A feeling hangs in the air that isn’t quite excitement, but not dread either. More a mutual anticipation mixed with the unbelievable chaos of a moment unlike any other. Saying a feeling hangs in the air suggests lack of motion, a static moment– but that’s not what I mean at all. 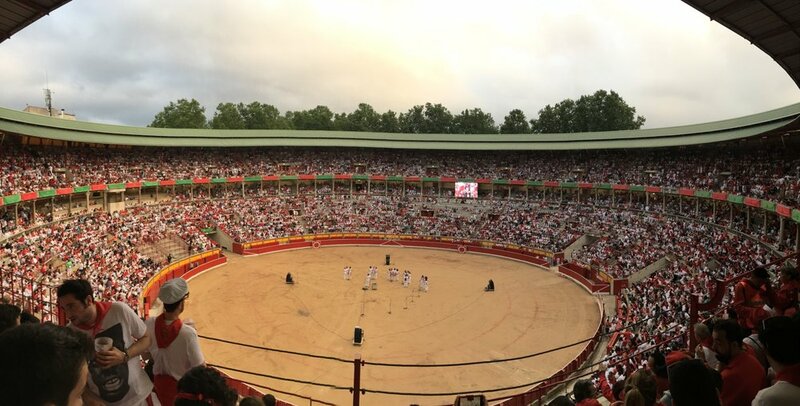 The feeling hangs in the air by the sheer force of almost 20,000 people waiting for the same second, but Pamplona’s crowded Plaza de Toros bullring couldn’t be further from motionless. The dancers have left the ring in follow-the-leader formation, the microphones from the singing group have been cleared, the “Kiss Cam” cameramen have ceased zooming in on onlookers– all the spectacles designed to keep a crowd this big entertained until the main event have disappeared, leaving an empty ring. Around the stadium, the sea of white t-shirts dotted with the traditional red neck bandanas of the San Fermín festival (colloquially “Running of the Bulls”) is rowdy and impatient. A group of young people brandishing cheap sangria in plastic cartons start the wave on one end, and the subsequent sections follow suit. Parents squeeze children into empty seats, gripping hands tightly as the crowd sways in motion. A girl tips back her head, laughing, as she pours wine straight from the bottle into her open mouth. A bleary-eyed man in a stained shirt stirs from the nap he’d been taking on the concrete floor. An older woman offers the strangers in the section around her jamón-flavored potato chips. A group of guys slosh their third round of beer in a “cheers” motion as they chant something rhythmic in Spanish. In some sections, you have to shout to be heard. Everyone is in motion, yet waiting at the same time. Did I mention it’s 7:55am? I’m not sure if I’ve been clear enough on the status of the crowd’s inebriation: everyone is drunk. The group doing the wave is drunk, the grandma handing out the chips is drunk, I assume the kids aren’t drunk (I might be wrong), but their parents certainly are. If I make anything clear in attempting to describe this scene of madness, let it be that every single person in the stadium is somewhere in the vicinity of hazy, slur-your-words drunk. OK, moving on. The clock strikes 8am. Somewhere, only two or three narrow, cobblestone streets away from where we stand, a wooden gateway swings open and six feisty, angry bulls are released from their confines. The adrenaline-ridden, sneaker-clad crowd who has chosen to run with the bulls are waiting just 100 meters ahead, and suddenly the chase is on. It’s almost a dance, if a terrifyingly dangerous one, as the thrill-seekers try to run as close as possible to the bulls without getting tossed, or worse–gored. People are trampled under hooves as the sprinting crowd rounds “Dead Man’s Corner,” entering the home stretch. When the first bull enters the bullring, charging full-steam-ahead and flanked by a stream of sweaty, relieved runners, I cheer. This is so exciting! The first bull! The girl in front of me turns around, and shushes me. Mildly indignant, I look around. She’s right­– the crowd isn’t cheering. They’re waiting. Now a feeling really is hanging in the air as the celebrations and revelries seem to freeze. Bull one, bull two, bulls three and four. When the final bull enters the ring, a roar erupts from the crowd. The band strikes up somewhere below, the Spanish chants start up again, people are yet again guzzling sangria– the girl who shushed me is now dancing and screaming, arm slung around her boyfriend’s neck as she cheers. The crowd was waiting, I realize, for everyone to make it in, watching for every bull to enter the ring and waiting for their brother/cousin/friend who had chosen to partake in the run to enter in safety. As the morning’s festivities progress and younger bulls are let into the ring one by one to tease the crowd (and by tease, I mean charge and toss and cause potentially fatal injuries), the grand inclusivity of the festival strikes me. Everyone is all in. The grandparents hauling coolers of home-cooked rice and champagne bottles, the babies dressed up in miniature San Fermín-themed onesies, the family members who eagerly await the safety of their loved ones running even though the act is completely voluntary– every single person at this festival buys in. Pre-arrival in Pamplona, I assumed the festival was solely for thrill-seekers. A young person’s game, an international draw for danger, something akin to a college football tailgate. But what I found was a giant cultural celebration: an entire week of utter madness that brings a whole country–almost a whole world– together. This is something that would never fly in the States. It appalls me as much as it thrills me that this is not only allowed, but wholly celebrated. People are quite literally trampled and left lying on the ground, and the band doesn’t stop playing. It may not be for the faint of heart, but the entire experience is a smack-on-the-head reminder of the value of seeing things that would never happen in my own world. Every second of San Fermín, a little voice in the back of my head is screaming, eyebrows raised and pupils wide, “how the HELL is this happening?” It’s so foreign to me, and yet it’s a massive, historic, multigenerational event for the people who surround me. The bubble I live in– the U.S. East Coast suburbs bubble I’ve always lived in­– is popped once again. The value of it all isn’t lost on me. Experiencing things that would never happen in the world I inhabit is a way to reach beyond the bubble, to understand something new and in turn make connections between what I know (and don’t know) about my own world. Especially during a time of such division in my own country, I’m reminded of how essential it is to not only read about and listen to cultures outside our own– but to actually experience them, fully immersed. Maybe I take all this too far by making a blog post on a drunken week of insanity about living in bubbles (don’t get me wrong– I was carrying a handle of vodka around at 10am insisting on getting cornrows), but it’s hard to walk away from the festival of San Fermín without feeling a bit like I popped a bubble, and gained something more than just sangria stains on my sneakers. 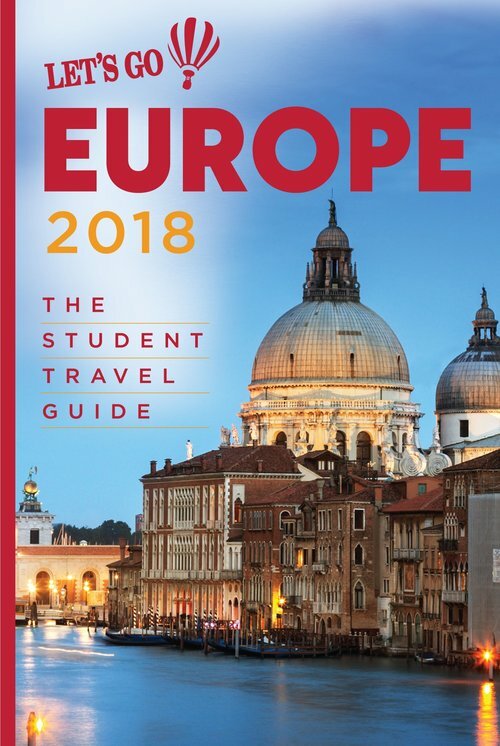 The advantages of experiencing something so outside my own world– so foreign, so shocking– was what will stay with me after the hangover fades (but I’m still waiting on that one).